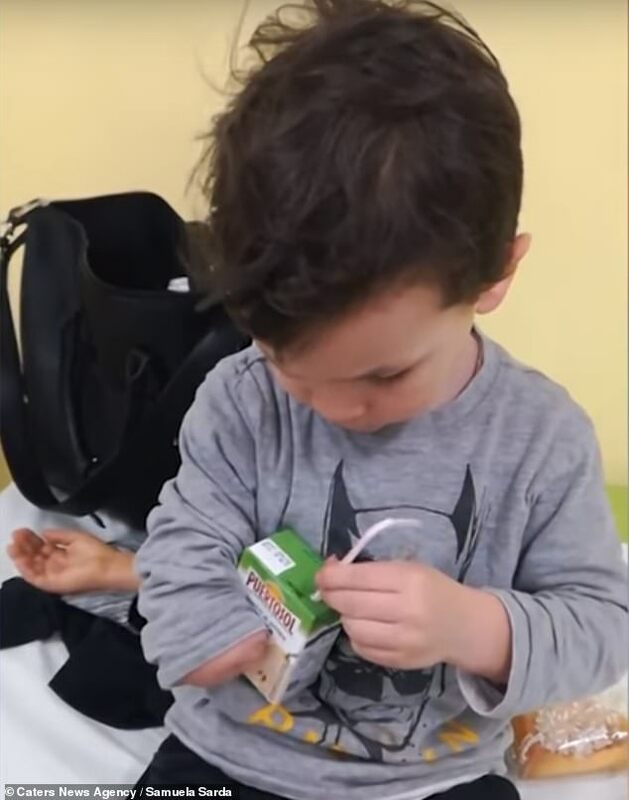 A heartwarming video has revealed the moment a three-year-old boy tries out a bionic arm for the first time. Giulio Spaziana, from Pomezia, Italy, was born without a forearm or hand on his right side. But doctors have now fitted him with a prosthetic limb which he can control using his electrical signals from his brain as though it were a real hand. In moving footage, he is seen grinning as he opens and closes the hand in a grabbing motion and shows off to his mother when he picks up a ruler unassisted. 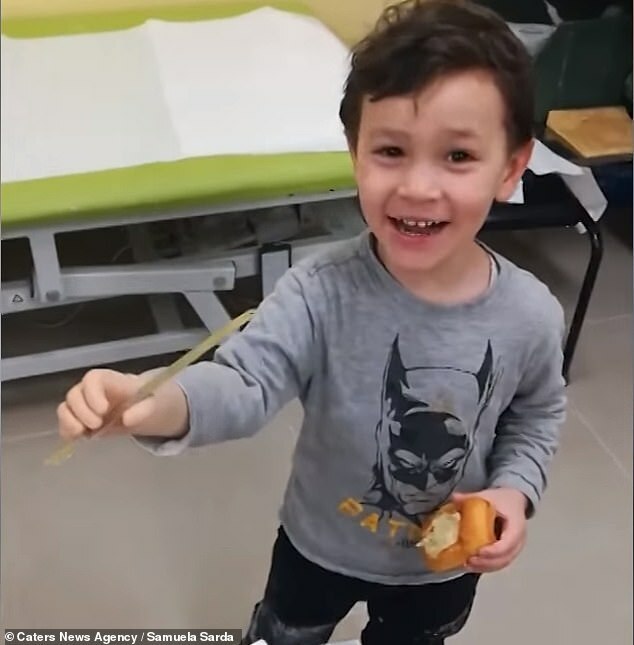 Three-year-old Giulio is congratulated by his mother behind the camera as he tests the new appendage with the help of a doctor. The bionic arm attaches to the stump of his upper arm and, with a prosthetic designed to look like a normal hand, is controlled by nerve signals. Giulio is able to open and close the hand like a claw, but not move individual fingers, in the appointment at the clinic in Palestrina, near Rome. Ms Sarda said her son is now becoming more and more independent thanks to the bionic arm with a hand that can be moved through electrical signals. 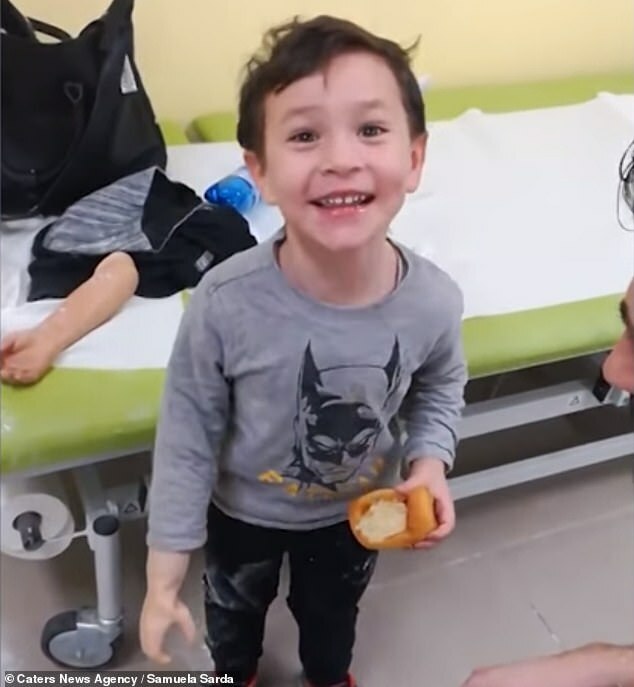 After trying out the hand and ecstatically picking up a ruler with it, Giulio asks his doctor, Daniele Zenardi, if he can keep the prosthetic. The video shows the first time Giulio has ever worn a robotic arm which can be activated and moved. However, he has been wearing prosthetics since he was just a few months old. Ms Sarda said: ‘When Giulio was younger, he had a fake arm which he couldn’t do anything with. ‘Early on we decided to call the arm “Energy”, a name that his brother Leonardo picked after a cartoon he had watched. ‘It just felt nicer than telling him to go get his prosthetic arm. According to Ms Sarda, her ultrasound scan during pregnancy did not detect the deformity. So when Giulio was born, his disability came as a shock for her and Giulio’s father, Massimo. Ms Sarda added: ‘When these things happen you either let them get to you and live unhappily, or you stand up and fight and life becomes even more beautiful than before. HOW DO MIND-CONTROLLED PROSTHETICS WORK? Prosthetics that attach to part of the human body are often objects that allow a person to perform a specific function – such as blades for running. Scientists are working to develop prosthetics that are personalised and respond to the commands of the wearer. To do this, small pads are placed on the skin of the patient. They are located around the end of muscles and where the nerve endings begin. The pads detect the electrical signals that are produced by the muscle nerves and translate this via a computer. To trigger these sensors, the patient must actively think about performing an action. For example, in order to signal a bicep contraction, the person wearing the prosthetic would have to think about bending their arm. By understanding what muscles are being signalled by the brain to contract, scientists can predict how a limb would move. This is then recreated by the prosthetic in real-time, allowing wearers to think an action and then the artificial limb will perform it.